While fettuccine is cooking, heat oil in 12-inch skillet over medium-high heat. Cook broccoli, cauliflowerets, carrots, peas and onion in oil 6 to 8 minutes, stirring frequently, until vegetables are crisp-tender. Stir in Alfredo sauce; heat through. Drain fettuccine. Stir fettuccine into sauce mixture; heat through. Sprinkle with cheese. With a vegetable pasta salad as simple as this, your kitchen won't hold you hostage while summer passes by. Oh Ferris. So full of wisdom. I’m pretty sure that on “days off” like his, or the all-too-often crazy days when my calendar hardly leaves any time for cooking, a delicious 15-minute meal like this pasta primavera would be JUST the ticket! This Pasta Primavera recipe pretty much could not be easier. 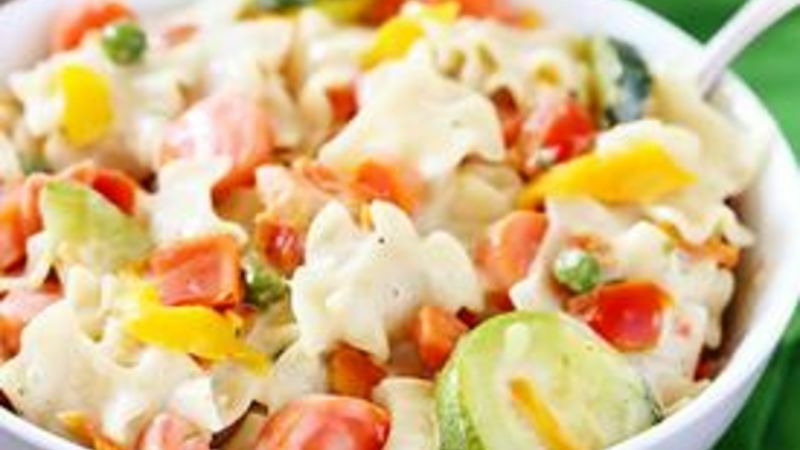 Betty Crocker’s Creamy Parmesan Pasta Suddenly Salad mixes with Valley Fresh Steamers do all of the work for you. Just follow the directions, and within 15 minutes, you can have a delicious pasta dish overflowing with fresh steamed vegetables ready to enjoy. It is so simple and quick, you’ll definitely have time to go and save Ferris. Like I said…just these ingredients (plus the mayo called for in the Suddenly Salad). Steam the veggies while you cook the pasta, then mix ‘er up! Look at all of those colorful veggies! That’s pasta prrrrrrimavera, baby!